Preheat the oven to 170°C/340°F (convection). To make the brownie base, set up a double boiler and melt part of the bittersweet couverture chocolate and butter. Combine sugar and eggs in a bowl and beat until creamy. Add the melted chocolate to the egg mixture, then the flour, and stir to combine. Spread the mixture over a lined baking sheet, sprinkle with chopped hazelnuts, and bake for approx. 10 – 15 min. Set aside to cool down. To prepare the chocolate mousse, bring the milk to a boil, then add the remaining bittersweet chocolate couverture to the milk and stir until melted. Beat egg white until stiff. Beat heavy cream until stiff. Gently fold the beaten egg into the cream, then fold in the chocolate mixture. Take your brownie base and cut out circles using cake rings (approx. 6-cm/2.5-in. diameter). Wash and halve the strawberries. Line the edges inside the cake rings with strawberries facing sliced-side upwards. 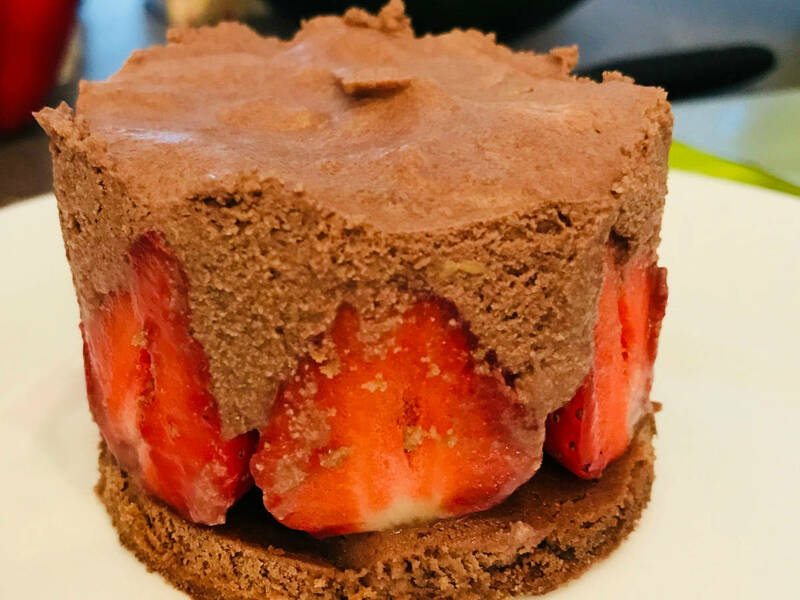 Carefully spread chocolate mousse on top of the strawberries. Refrigerate for approx. 4 hrs. Enjoy!